A map of the Moon combining observations in visible and ultraviolet wavelengths shows a treasure trove of areas rich in titanium ores. Not only is titanium a valuable element, it is key to helping scientists unravel the mysteries of the Moon's interior. Mark Robinson and Brett Denevi will be presenting the results from the Lunar Reconnaissance Orbiter mission today at the joint meeting of the European Planetary Science Congress and the American Astronomical Society's Division for Planetary Sciences. "Looking up at the Moon, its surface appears painted with shades of grey -- at least to the human eye. But with the right instruments, the Moon can appear colorful," said Robinson, of Arizona State University. "The maria appear reddish in some places and blue in others. Although subtle, these color variations tell us important things about the chemistry and evolution of the lunar surface. They indicate the titanium and iron abundance, as well as the maturity of a lunar soil." The Lunar Reconnaissance Orbiter Camera (LROC) Wide Angle Camera (WAC) is imaging the surface in seven different wavelengths at a resolution of between 100 and 400 meters per pixel. Specific minerals reflect or absorb strongly certain parts of the electromagnetic spectrum, so the wavelengths detected by LROC WAC help scientists better understand the chemical composition of the lunar surface. Robinson and his team previously developed a technique using Hubble Space Telescope images to map titanium abundances around a small area centered on the Apollo 17 landing site. Samples around the site spanned a broad range of titanium levels. By comparing the Apollo data from the ground with the Hubble images, the team found that the titanium levels corresponded to the ratio of ultraviolet to visible light reflected by the lunar soils. "Our challenge was to find out whether the technique would work across broad areas, or whether there was something special about the Apollo 17 area," said Robinson. 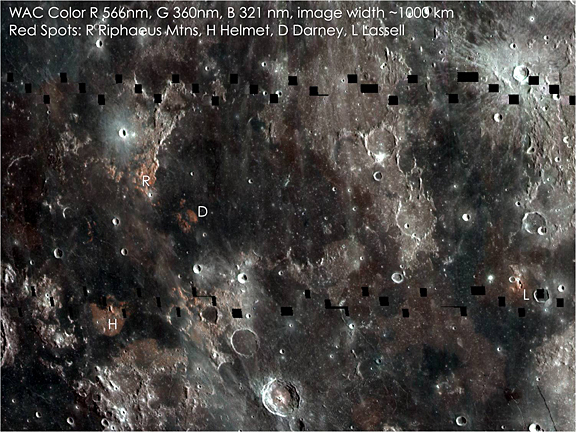 Robinson's team constructed a mosaic from around 4,000 LROC WAC images collected over one month. Using the technique they had developed with the Hubble imagery, they used the WAC ratio of the brightness in the ultraviolet to visible light to deduce titanium abundance, backed up by surface samples gathered by Apollo and Luna missions. The highest titanium abundances in similar kinds of rocks on Earth are around one percent or less. The new map shows that in the maria, titanium abundances range from about one percent to a little more than ten percent. In the highlands, everywhere titanium is less than one percent. The new titanium values match those measured in the ground samples to about one percent. "We still don't really understand why we find much higher abundances of titanium on the Moon compared to similar types of rocks on Earth. What the lunar titanium-richness does tell us is something about the conditions inside the Moon shortly after it formed, knowledge that geochemists value for understanding the evolution of the Moon," said Robinson. Lunar titanium is mostly found in the mineral ilmenite, a compound containing iron, titanium and oxygen. Future miners living and working on the Moon could break down ilmenite to liberate these elements. In addition, Apollo data shows that titanium-rich minerals are more efficient at retaining particles from the solar wind, such as helium and hydrogen. These gases would also provide a vital resource for future human inhabitants of lunar colonies. "The new map is a valuable tool for lunar exploration planning. Astronauts will want to visit places with both high scientific value and a high potential for resources that can be used to support exploration activities. Areas with high titanium provide both -- a pathway to understanding the interior of the Moon and potential mining resources," said Robinson. The new maps also shed light on how space weather changes the lunar surface. Over time, the lunar surface materials are altered by the impact of charged particles from the solar wind and high-velocity micrometeorite impacts. Together these processes work to pulverize rock into a fine powder and alter the surface's chemical composition and hence its color. Recently exposed rocks, such as the rays that are thrown out around impact craters, appear bluer and have higher reflectance than more mature soil. Over time this 'young' material darkens and reddens, disappearing into the background after about 500 million years. "One of the exciting discoveries we've made is that the effects of weathering show up much more quickly in ultraviolet than in visible or infrared wavelengths. In the LROC ultraviolet mosaics, even craters that we thought were very young appear relatively mature. Only small, very recently formed craters show up as fresh regolith exposed on the surface," said Denevi, of Johns Hopkins University Applied Physics Laboratory. The mosaics have also given important clues to why lunar swirls -- sinuous features associated with magnetic fields in the lunar crust -- are highly reflective. The new data suggest that when a magnetic field is present, it deflects the charged solar wind, slowing the maturation process and resulting in the bright swirl. The rest of the Moon's surface, which does not benefit from the protective shield of a magnetic field, is more rapidly weathered by the solar wind. This result may suggest that bombardment by charged particles may be more important than micrometeorites in weathering the Moon's surface. Figure 1: http://www.europlanet-eu.org/outreach/images/stories/ep/news/epsc2011/lroc_picture1.jpg LROC WAC mosaic showing the boundary between Mare Serenitatis and Mare Tranquillitatis. The relative blue color of the Tranquillitatis mare is due to higher abundances of the titanium-bearing mineral ilmenite. Enhanced color formed as 689 nm filter image in red, 415 nm in green, and 321 nm in blue [NASA/GSFC/Arizona State University]. Figure 2: http://www.europlanet-eu.org/outreach/images/stories/ep/news/epsc2011/lroc_picture2.jpg Full-resolution WAC three-color composite (566 nm filter image in red, 360 nm in green, and 321 nm in blue) highlighting regions with varying mare compositions and enigmatic small volcanic structures known as "domes" [NASA/GSFC/Arizona State University]. Figure 3: http://www.europlanet-eu.org/outreach/images/stories/ep/news/epsc2011/lroc_picture3.jpg LROC WAC color ratio 321/415 nm shows little variation due to crater rays. The dark haloed crater, Giordano Bruno, in the upper center is thought to be quite young and thus "immature" and thus still has a distinct UV signature. The most immature material on the Moon as defined by the UV maturity signal are the enigmatic "swirls". The swirls are likely due to local relatively intense magnetic fields standing off the solar wind and thus protecting mineral grains from the maturing effects of solar wind sputtering [NASA/GSFC/Arizona State University]. Figure 4: http://www.europlanet-eu.org/outreach/images/stories/ep/news/epsc2011/lroc_picture4.jpg LROC Wide Angle Camera mosaic centered on the lunar swirl Reiner Gamma and corresponding UV/visible light ratio (321/415 nm) [NASA/GSFC/Arizona State University]. Lunar Reconnaissance Orbiter was built and is managed by NASA's Goddard Space Flight Center, Greenbelt, Md. The exploration phase was funded by NASA's Exploration Systems Missions Directorate in Washington, D.C. LRO operates under NASA's Science Mission Directorate.